This is a great example of how trigger points can create a confusing referral pattern that leaves you chasing the wrong muscle. These people grab their hamstring and talk about how painful it is. They are often quite careful about not stretching their ham too aggressively. They may spasm easily when the knee if flexed to touch the heel to their hip. I’ve seen a lot of this problem over the years, especially from runners. This seizing hamstring can really shut down their activity and confuse them. Their hamstring goes into painful spasm even though they continue to stretch it as directed. This can be debilitating and discouraging. The problem is that the seizing hamstring is a referral pattern of another muscle, the gluteus minimus. The gluteus minimus is located on the side of the hip. I’ll help you to see that seizing hamstring pain is really the referral of the gluteus minimus and not the lateral hamstring itself. Let’s elicit the pattern for the hamstring first. 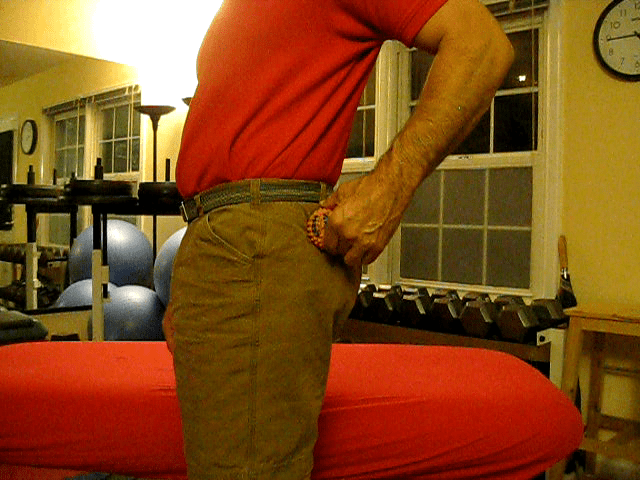 One easy way to elicit trigger point referral is to stretch the muscle. Lay on your back, straighten your knee and stretch your hamstring by pulling your leg back toward your chest while keeping the knee straight. If you want to focus the stretching on the lateral hamstring, turn the toe out. That’s right! You feel it behind the knee! Here is the referral pattern for the lateral hamstring. Notice how it extends down the side of the leg but is mostly felt in the back of the knee. 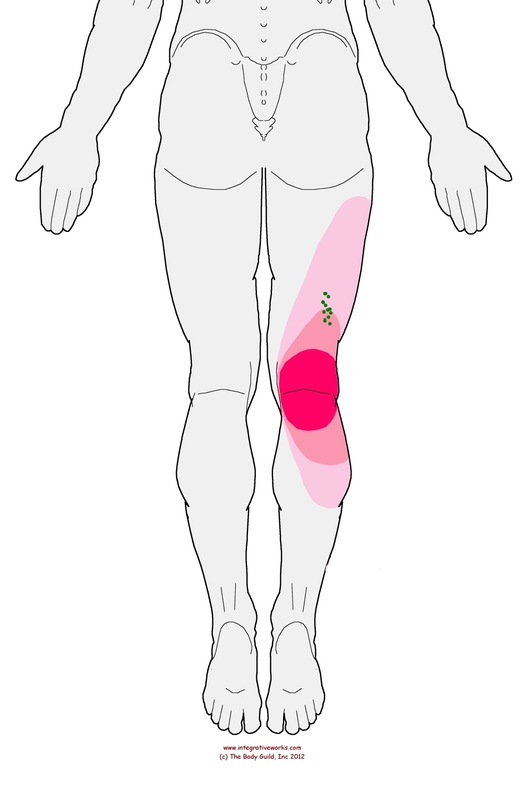 You can also press into your hamstring near those green spots in the pic and you’ll feel it in the back of knee too, but that is harder to do by yourself. Place the ball here to elicit the seizing hamstring. Now, let’s elicit the pattern from the gluteus minimus. Look at the picture above to see where you should place the ball. Take a tennis ball and lay it on the floor. Now, lay on the tennis ball so that it presses into this spot. You may need to squirm around on it a bit to find the specific spot. Most people guess too far back and need to turn onto their side a bit more with the ball farther forward. 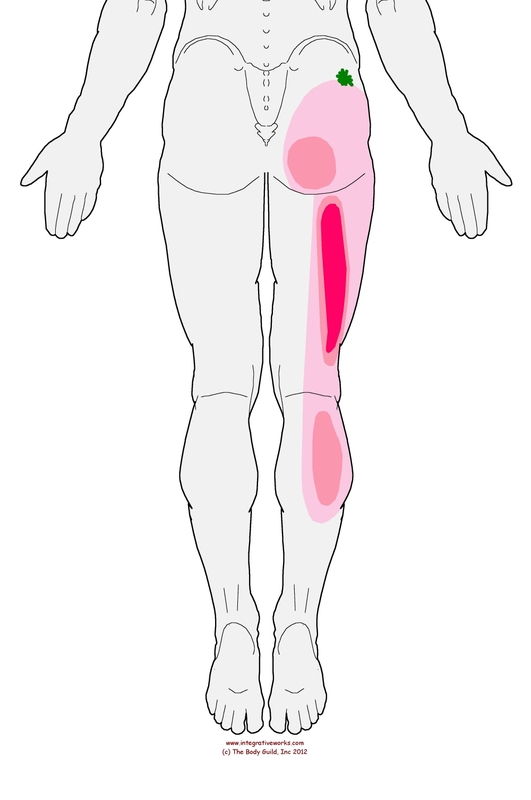 There are several trigger points in this area that produce different pain patterns into the hip and down the leg. This is the pattern that you should find. The ball should be placed at the green spot where the trigger point is located. The sensation of a seizing hamstring can be felt strongly when it is elicited. Again, pay attention to the subtle parts of the pattern. Notice the tension in the calf and the tension in the lower hip. If you’re a massage geek, take a look at this paper on assessment of gluteus minimus. It covers the common complaints, perpetuating factors and pain patterns. Here’s a video on how to use the tennis ball to release the trigger points in your hip. This is a very helpful home program but your neuromuscular therapist needs to address other issues, like balancing your pelvis, for lasting results. Want to know more about the difference between Trigger point referral and sciatica? Click here.